You’ll never know how good the first three “Diary of a Wimpy Kid” movies were until you’re forced to see the fourth one. 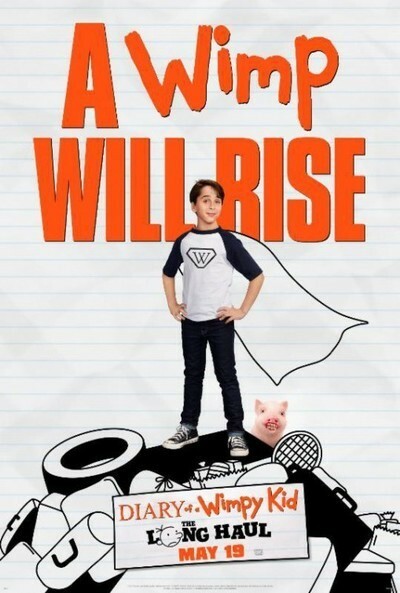 And it’s not just because “Diary of a Wimpy Kid: The Long Haul” has a whole new cast, although that is one in a series of contributing factors in its inferiority. It’s been five years since the last movie, “Diary of a Wimpy Kid: Dog Days,” so finding new actors was a necessity in the series’ perpetual middle-school setting. But the previous cast (Zachary Gordon, Devon Bostick, Steve Zahn and Rachael Harris) brought a level of humanity to the zany proceedings that kept them relatable and grounded. “Dog Days” even featured some legitimate, father-son drama. Bostick in particular brought a wonderfully weird, subversive vibe to his big-brother bully character, Rodrick. And while none of the previous films fully captured the spirit of the popular Jeff Kinney books that inspired them—a silly and smart mix of cynicism and heart—they came way closer than this new installment does. “The Long Haul,” which returning director David Bowers co-wrote with Kinney himself (shockingly), jettisons everything that’s honest and worthwhile about the books in favor of hackneyed misadventures and gross-out scatological humor. And that’s before the Heffley family inadvertently adopts a baby pig from a country fair. It is a tried-and-true premise, the wacky family road trip, but “The Long Haul” breathes no new life into it. From weirdoes on the highways and woeful motels with empty pools to kitschy roadside attractions and calamitous off-road detours, you have seen this all before. Many, many times. This material had long seemed stale when the “Vacation” reboot came out in 2015. Bowers’ slapstick tone and frantic pacing strain desperately to create an escalating sense of giddy mayhem, but the result feels like a lot of wheel-spinning. But dad Frank (Tom Everett Scott) secretly still has work to do. The eponymous wimpy kid, Greg (a likable Jason Drucker), tries to sneak in time playing his favorite video game, Twisted Wizard, on his phone. And rocker older brother Rodrick (played as a much dimmer bulb by Charlie Wright) wants to bang his head to the music of his terrible metal band, Loded Diper. The youngest Heffley child, Manny (Dylan and Wyatt Walters), makes shrieky noises of his own every time his pacifier falls out of his mouth. Such concern over the detrimental, cumulative effects of prolonged screen time couldn’t be more relevant. And trust me, the struggle is real. But “The Long Haul” reduces these figures—especially the parents—to shrill stereotypes, as flimsy as their stick-figure renderings on the page. Greg and Rodrick figure out a way to satisfy their needs by reprogramming the GPS and taking the family closer to Indianapolis, where there just happens to be a video game convention the same weekend. Greg figures if he can post a video of himself meeting his gamer idol (an obnoxious Joshua Hoover), he can live down the Internet infamy he’s achieved in an unfortunate meme. (It’s a complicated attempt to contemporize the book—don’t ask.) And Rodrick thinks he can play some drumming video game and win some money. Needless to say, nothing goes as planned. But along the way, there are plenty of poop, pee and vomit jokes (courtesy of copious sticks of fried butter and a spinning amusement park ride). There is the aforementioned pig, who ends up being the cleverest character of all. And out of nowhere, there is a lengthy and lovingly crafted homage to the shower scene in “Psycho.” It’s the only segment the film critics in the audience at my screening enjoyed. The downside of this is that you’ll have to have a potentially uncomfortable conversation in the car with your kids on the way home, explaining the importance of “Psycho.” The upside is that you’ll get to talk about “Psycho”—instead of “The Long Haul”—which should improve your own haul significantly.